The state-of-the-art assembly procedures and patented triple-sealed panel joints used to manufacture CAD Air Handling Systems result in leakage rates that are 75% to 90% less than even the highest quality custom-built metal units, along with a 10-15% increase in overall thermal efficiency. Because all the components used in our assemblies are non-conductive, and because we employ no metal fasteners in joining our panels, we eliminate the thermal bridging that all metal panels inherently exhibit. In place of the metal fasteners, CAD joints are triple-sealed with elastomeric adhesives internally, and caulking sealant externally. This results in a far tighter, more secure, and durable joint. In fact, the external sealant visible from the outside of our units is not even necessary for air leakage performance, and our air seal would be maintained even if all of the visible caulking were removed. The SMACNA air duct leakage test manual is the current standard for determining leakage rates. The lower the leakage class, the better the performance. Today’s commercial HVAC equipment manufacturers publish SMACNA leakage rates between SMACNA 6 and SMACNA 15. High quality custom-built units may achieve SMACNA class 3 in some cases. Our units have been independently tested at 10” of static pressure, achieving an incredible rating of SMACNA class 1.6. At the same time, panel deflection of less than L/240 was also tested and confirmed. Depending on the unit airflow and dimensions, SMACNA class 1.6 may mean leakage as low as one tenth of one percent of the design flow at 10” w.g. Here is a spec-stopper that actually equates to performance and value for the customer. As a result of these superior construction techniques, our equipment performs at SMACNA Class 2 leakage rates or better, while competitive units perform at SMACNA Class 6 to Class 15. Depending on the unit configuration, this can mean leakage rate as low as 1/5th of one percent. Yes, that’s 0.2% leakage! Manufacturers of metal units claim to have a thermal break construction to reduce the thermal bridging between the inner and outer panel liners. And this is technically true, but that “thermal break” is often comprised of nothing more than a small piece of 0.25" plastic or neoprene gasket placed between the steel liners. The overall panel R-value is compromised due to the lack of effectiveness of the thermal break thickness as well as eliminating any condensation forming on the surface of the panel. CAD's thermal break is as thick as the panel itself, providing a more effective overall panel R-value and eliminating any chance of condensation forming on the panel joint. More importantly, the major part of the industry uses only one external caulking joint to seal against leakage. And that single seal is prone to damage when the metal expands and contracts with temperature, or flexes during rigging or in even during regular operation. So when the seal is inevitably degraded, leakage rates soar. Finally, metal units typically employ metal fasteners such as self-tapping screws, which compromise the unit’s air seal and create water and air leakage paths. Not to mention that any metal fastener is prone to rust over time and exposure to the environment. In terms of thermal performance, typical applications should see a 10 to 15 percent increase in thermal efficiency due to this reduced leakage and true no thru metal construction. 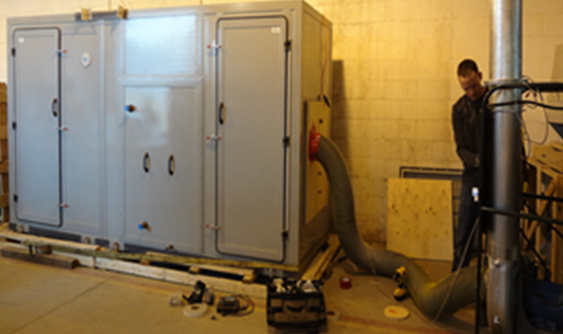 A typical 30,000 CFM air handler with 75 tons capacity, a surface area of 1,240 sq. ft. and meeting SMACNA class 15 will have a leakage rate of 830 CFM at 10” w.g.. C.A.D . units, at less than SMACNA 2, will leak less than 110 CFM. This translates into over 4 tons of cooling saved at peak cooling, and even more in the heating season.